“She was a very popular exhibit at the time,” he said. The display was even featured on an MSU Museum post card. But, with increasing sensitivities to the display of human remains, the exhibit was dismantled, and the mummy spent the next 40 years being shuffled between secure storage areas at MSU. 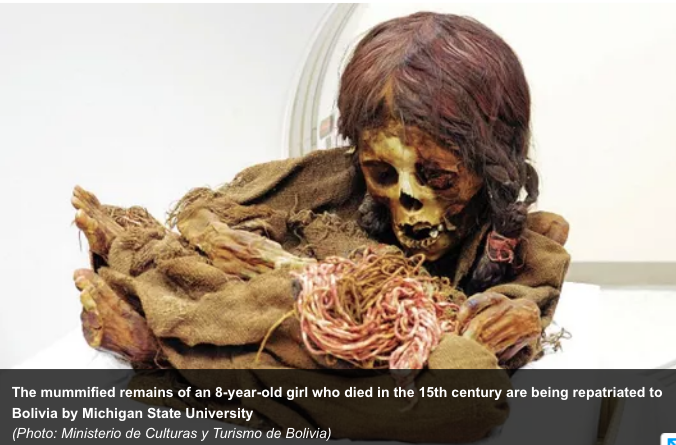 “About three years ago, I came to the conclusion that, if nobody was going to be doing any work with either the artifacts or the humans remains and if we were not going to display the human remains, it would be better served to return them to Bolivia,” he said. The girl was buried in a stone tomb known as a “chullpa” accompanied by leather sandals, a sling, a gourd full of small pebbles and a bag of corn, fruit and beans. Corn found in one of her bags was radiocarbon dated to roughly 1470. MSU hasn’t done any destructive analysis of the remains themselves. “I don’t often encounter an artifact with this much richness,” Trigo said, speaking in Spanish. But he also said that, “With a patrimonial object like this, it’s important that it’s accessible to the public in some way,” and the archaeology museum is planning a public exhibition of the remains in 2019. Beyond the museum’s designation as MSU Museum Accession 943, the remains aren’t named. That may change once they are returned to the government of Bolivia, Auslander said.